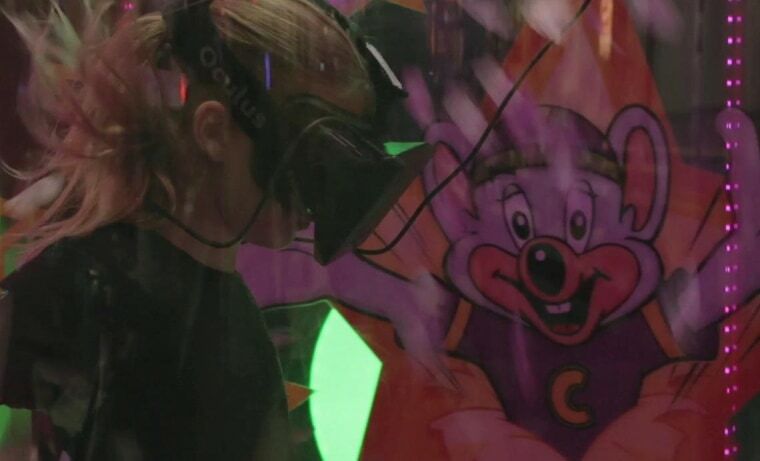 Chuck E. Cheese's may be known for skeeball and pizza, but this is definitely cutting edge: The kid-friendly restaurant/arcade chain has set up an Oculus Rift for a virtual ticket-blasting experience. "Ticket Blaster" may not be the high-fidelity dogfighting experience we got to test at CES in January, but it does look like fun. After kids don the virtual reality headset, they're instructed by Chuck himself to move their head around and put floating virtual tickets in the crosshairs. Meanwhile, real tickets fly around them within the game's clear plastic booth. Any tickets they manage to blast using the headset (and presumably any they snatched out of the air) can be redeemed at the counter, and traded for all manner of treasures. The kids in the demonstration video certainly do appear to be having a great time, and although the head-tracking goggles must be an unfamiliar experience, they seem to get the hang of it quickly. Chuck E. Cheese's partnered with Reel FX, a Texas-based animation company, to make the "Ticket Blaster" experience, and there's likely more where that came from. Reel FX's hometown of Dallas will be first to house a publicly playable version of the game, and locations in Orlando and San Diego are next up.